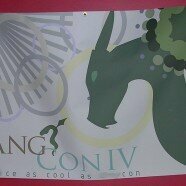 A banner was made for the last one I hosted. I need more wall space so I can hang it up permanently. We can all probably agree that our ultimate goal as gamers is to find and keep a regular, fun, weekly or bi-weekly game. Long running campaigns that slowly craft characters and epic stories over numerous sessions are the Holy Grail to pretty much all roleplayers. The catch is that there are so many wonderful games and game ideas out there, but so little time to play them all. We want a regular, epic game, but we also want to play that shiny new system we picked up at the game shop. How do you solve that dilemma without a TARDIS or a time-turner? Conventions offer a way to try out new games or even old favorites we rarely get to play, but why should our one-shot enjoyment be limited to conventions? Why not plan a one-shot event the same way you’d plan a party? I planned my own damn con. Well, it wasn’t quite a real convention. It was held in my apartment for only one day and there were only eight attendees, myself included, but I was determined to capture the excitement of a con instead of turning it into just an extra, regular old game night. To kick the day off, we started off with a Pirates of the Spanish Main CCG tournament where was even a prize for the winner. After dinner, I ran a D&D game. The adventure itself wasn’t much to speak of (I was so new to GMing, I still squeaked), but it was a fun cast of pre-made characters with interwoven backgrounds and connections. While I didn’t have much of an idea what I was doing with the running of the game, there was more than enough awesome character interaction to make up for it (“Someone’s village is obviously missing its idiot.” “Who are you calling a villager!?”). Treating the day as an event helped turn my game day party into a huge success. Everyone had a blast and demanded that I do it again. 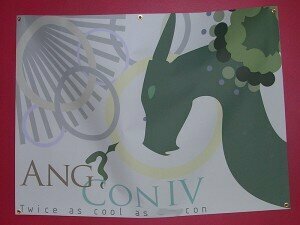 I ended up hosting an ‘AngCon’ three more times over the next few years. Each time, I went out of my way to try and make the day something special. One of the biggest ways to do this is to make sure to extend the invitations beyond your regular gaming group. I have a number of friends who are ex-gamers or at least infrequent gamers. This has happened for a variety of reasons, usually to do with work and family or other responsibilities. While they may not be able to make time for a weekly game, making time to attend a party is a little easier. 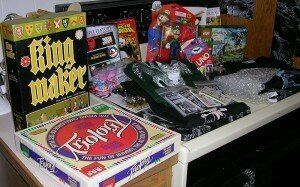 The day is also a prime opportunity to invite non-gamers that have expressed interest in the hobby. Just as the event is a chance to play games you may not otherwise play, it is also a chance to play with people you may not get to play with as often. Everyone donated a ton of fun things to give out as swag. The Lego Orc guards my desk at work to this day. Swag was another fun element to the whole endeavor. During the first ‘AngCon’, I made sure there was a prize for the winner of the Pirates of the Spanish Main tournament, but I also made sure everyone had new packs of ships to take with them. By the time the next one rolled around, others had also started donating items to give away as freebies. The last time I was able to host one of these, we had a wide array of games, t-shirts, action figures, and other cool tidbits that had been donated by many of the guests. Everyone went away with something cool, including the ‘ugly die’ that was awarded to the person voted best roleplayer of the night. Of course, the most important part of the recipe for a good event like this is the game played. There was a little more freedom with whatever we played during the first half of the day, from the Pirates tournament to a rousing game of Are You A Werewolf?, or even just an epic Carcassonne game with ALL the tiles (with time limits imposed because, whoa dude). My main focus went towards planning the roleplaying game that took up the second half of the party. In addition to that very first D&D game I ran, at a following event I ran a large, chaotic Mutants & Masterminds game. All the characters were powered teenagers trying to solve a mystery involving a missing star quarterback on the eve of the big homecoming game. Due to the tastes of my regular group, I don’t often get to run teenaged superhero games, but they’re willing to give it a go as a one-shot. Despite being the ragtag misfits of high school, they stepped up to help save the day, turning the game into something akin to The Breakfast Club, just with super powers. Another ‘AngCon’ let me get a little more creative as I worked to accommodate a larger guest list that had outgrown my being able to run a single game for everyone. Recruiting a fellow GM, we concocted a D&D scenario that sent two rival adventuring parties after the same MacGuffin. The two groups were led by feuding brothers with the rest of the characters seeded with their own motivations and goals. For the first two thirds of game, we ran them separately as they traversed different routes towards the final resting place of the MacGuffin. We might have created the rivalry between the two groups a little too well, because when the resident blue dragon appeared to defend his home and protect his treasure, most of the players stayed focused on beating the crap out of one another rather than banding together to defeat the dragon. Yasssss doooo eeeeeeet I will totally donate some swag. Oooh Carcassonne…. Ang, we should totally play Carcassonne next time we meet! Sorry to hi-jack this comment box, but I just read Ang’s guest article on Gnome Stew and discovered your excellent site. Nice article – though not as good as most of the stuff you all have on here. Excellent work, please keep it up. Couple of requests though – is there any chance of adding the option to have articles emailed out (like the Stew) as well as all the social network stuff, I don’t really go in for all that twit-face hangout stuff and without something dropping into my inbox, i’m going to forget to keep checking back here and that would be a shame! Also, this was the only way I could find to contact you, a ‘Contact Us’ page / email thingy would also be nice. I’m really enjoying the fresh ideas and good writing – more of the same please! I will speak to our Tech Guru to see about setting up something like an e-mail feed. I know we have the RSS feed set up, but I’m not sure on the specifics of getting that set up to e-mail people. He’ll know, I’m sure. As far as the Contact Us info goes, THANK YOU for the reminder. We actually have Rogue Princess e-mails for all of us, but adding that info to the site slipped through the cracks.